Sunday Funday – Eat. Rest. Repeat. My intention wasn’t to make a post about my day today, but to write about my favorite restaurants in the area. 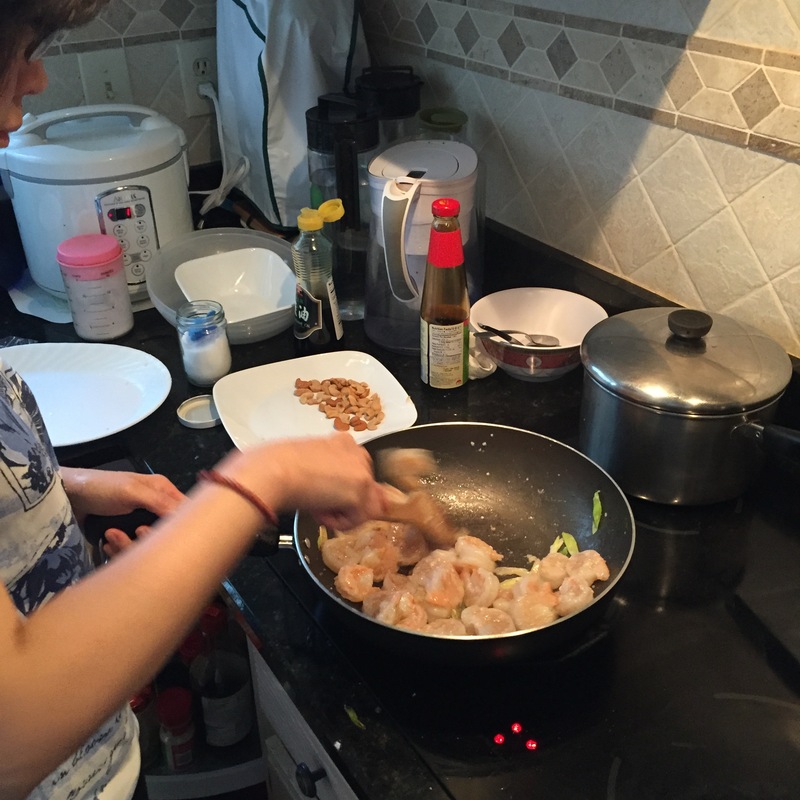 Well…I decided I’m not quite ready for an all star blog yet, so food diary for Sunday August 23rd it is! It’s not often that I sleep in past 8 AM, but when I do, I wake up STARVING. So I got up around 10:30 this morning and was ridiculously hungry, craving the dinner I had the night prior. My mother made a pretty spectacular meal last night for a combination birthday dinner for my sister and I…. I don’t have recipes for any of these dishes, but since my mother worked so hard slaving away in the kitchen and plating the dishes all nice and pretty, I feel obliged to share some of her goodies. 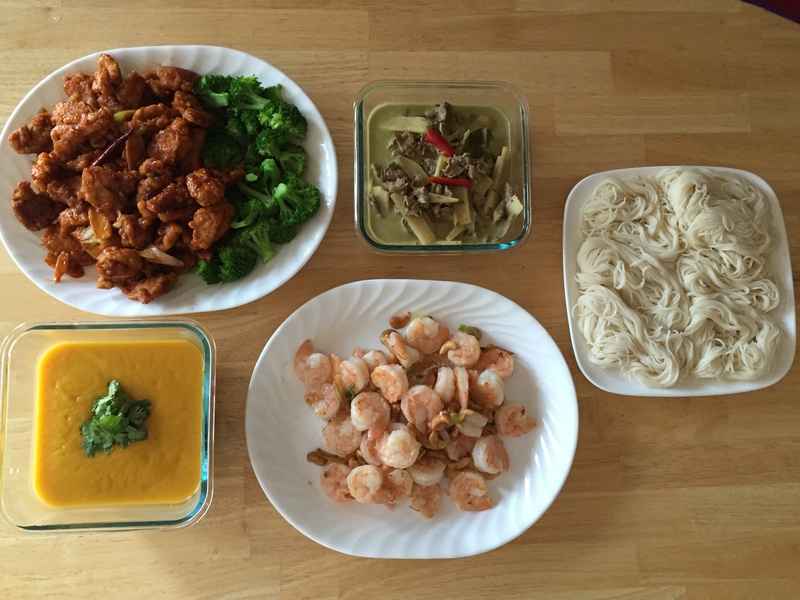 The noodles on the far right are to be eaten with the green curry, a customary Thai tradition. 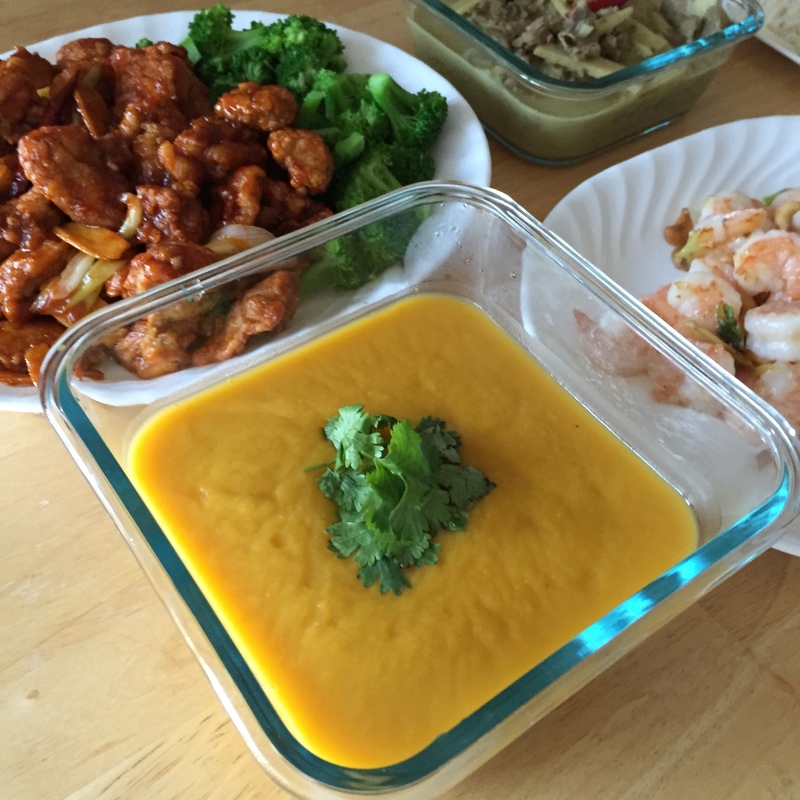 She didn’t make my usual favorites because she wanted to showcase her talents (I think she was secretly hoping her new featured dishes would end up on my blog)….but everything came out really well! 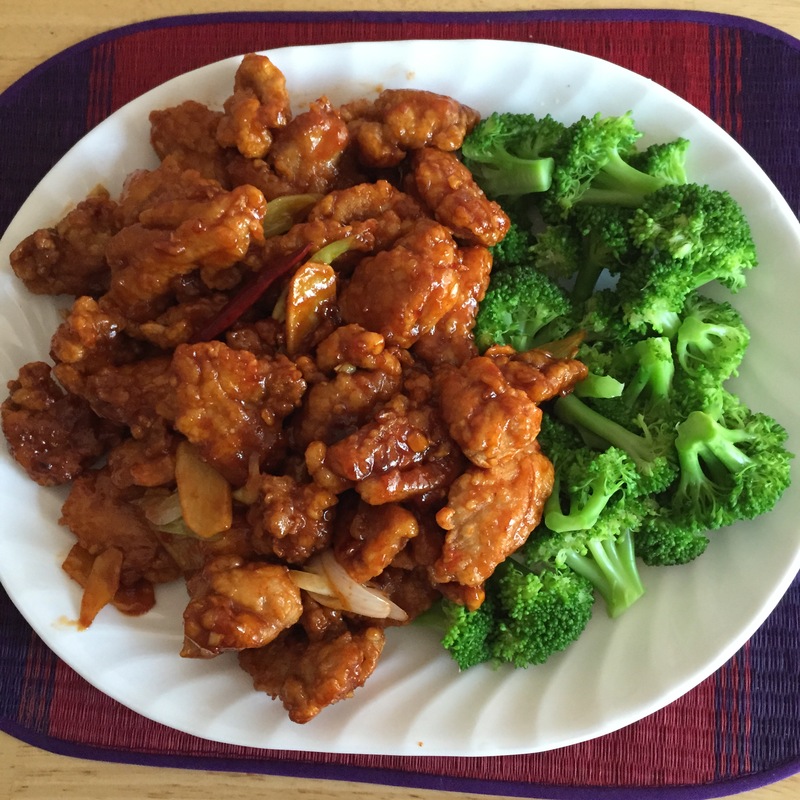 It was my first time having her sweet and sour chicken and it tasted better than any Chinese style S/S chicken I’ve ever had. Alright, onto my food filled day today. 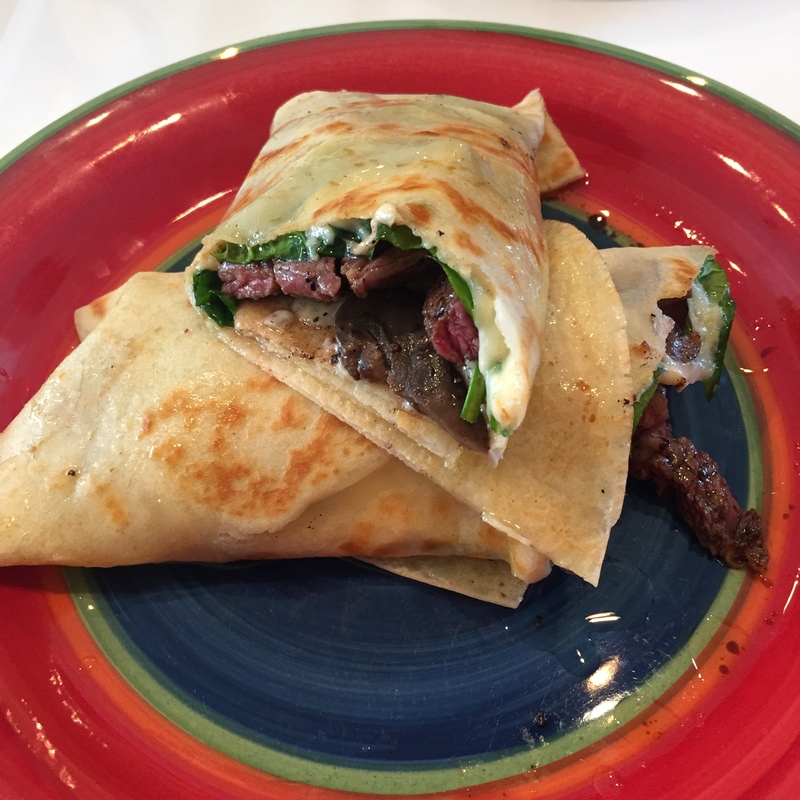 About a week ago, I saw an Instagram post of a place called The Crepe in Royal Oak…. Of course, with most Instagram photos I see, a recommendation is all I get out of it with no review tacked on; so here’s MY review. I LOVED what I got. I ordered the truffle steak stuffed crepe. I forget what exactly it’s called on the menu, but if you see “steak” and “truffle”, that’s the one. 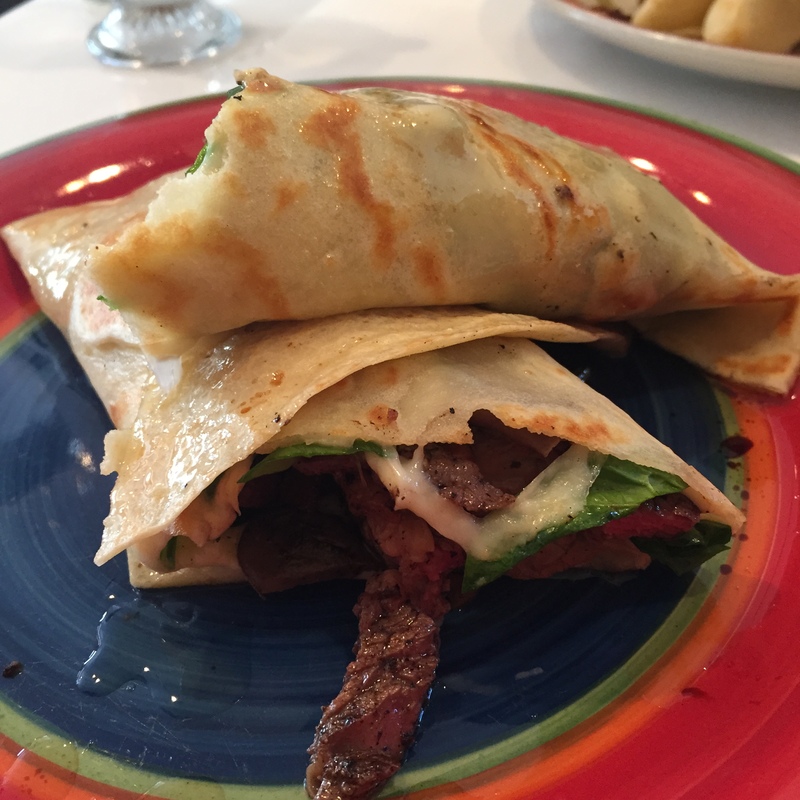 This crepe was stuffed with spinach, mushrooms, truffle zip sauce, and of course, steak. It was so rich and tasty, with an intense aroma of truffle. For those of you who are not fond of truffle, I caution you against it. It isn’t overpowering by any means, but it sure isn’t subtle. I personally love truffle; with the combination of that aroma and my perfectly medium cooked steak, I was thrilled with my brunch. It had just the right amount of salt and umami. I give this a thumbs up. Pictured above was my husband’s crepe. Unfortunately, his unimpressed facial reaction was all I needed to discourage me from tasting it myself. 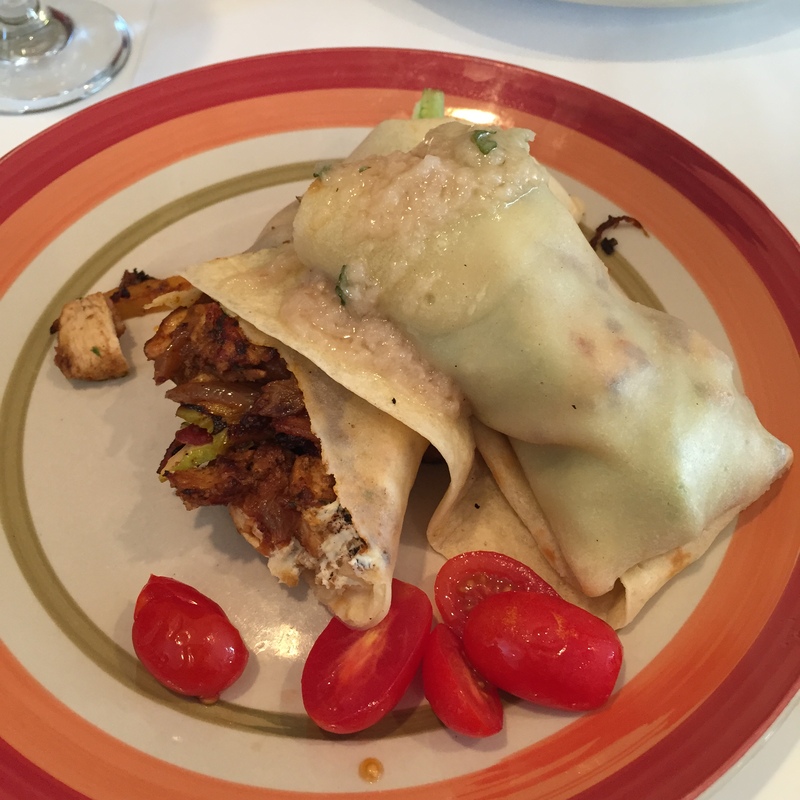 This particular crepe was stuffed with chicken, apples, and goat cheese, amongst some other veggies. He was underwhelmed with the taste of the crepe wrapper and overall seemed a little taken aback by the flavors inside the crepe. Goat cheese grosses me out. The thought of the pungent smell makes me gag, so anything that features goat cheese as an ingredient is always my last choice. My husband, however, loves goat cheese, but that wasn’t enough to leave a good impression on him. 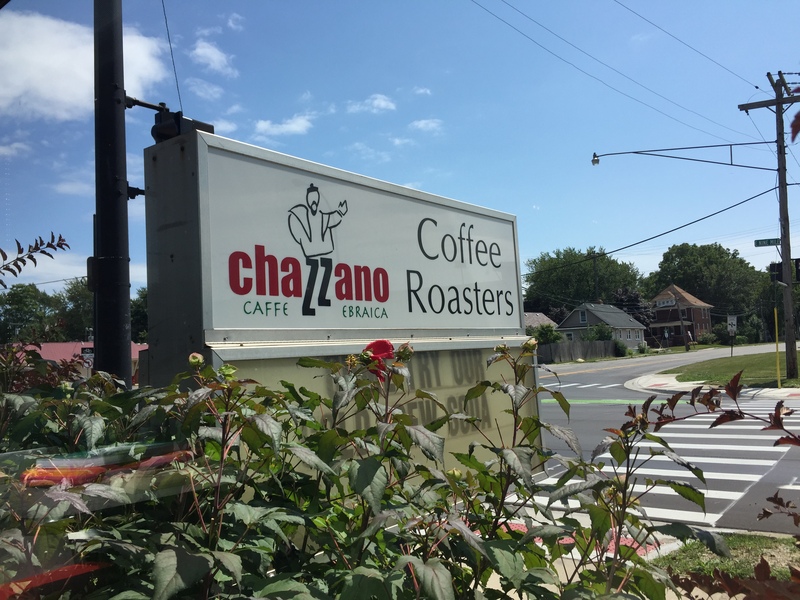 After lunch, we went to my new found love, Chazzano Coffee in Ferndale. This was my second time going there this week, and I cannot stop raving about it! The service is impeccable; they roast their coffee in house, and distribute it all across the country. This place was kind of hard to find, as it is just a small building on a rather busy road….but once inside, you almost feel like part of a family. Everyone knows each other, and if you’re new to this “family” of a coffee shop, they are more than happy to strike up a conversation and make you feel like you’re a VIP. I had the pleasure of meeting the owner this past Thursday, and upon speaking to him, he emitted a strong love and passion for his work. He took me on a tour of the cozy shop, showing me different raw coffee beans and explaining the different ways roasting can pronounce certain notes in specific beans. The descriptions they provide of the taste profiles are pretty accurate, and they do a phenomenal job of producing gourmet coffee. Here are some raw coffee beans prior to the roasting process. 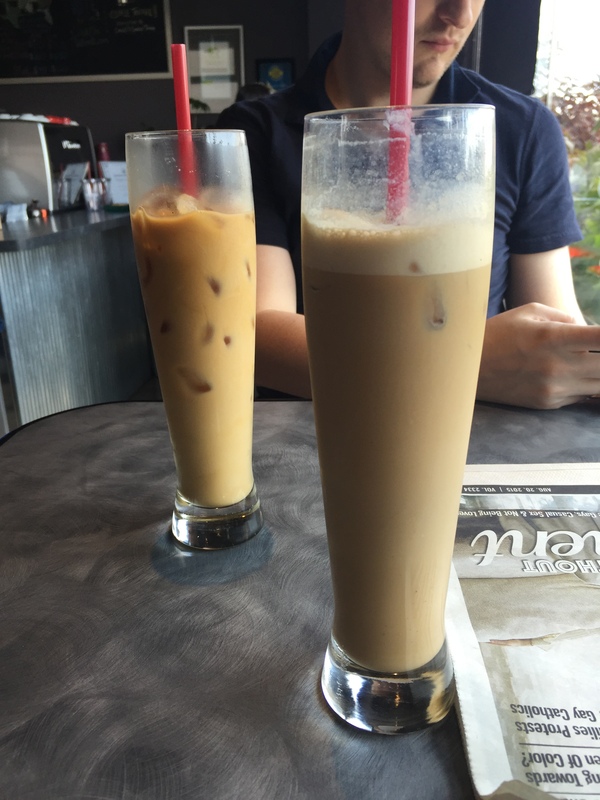 If you happen to like cold brew, they make some fantastic iced coffee! 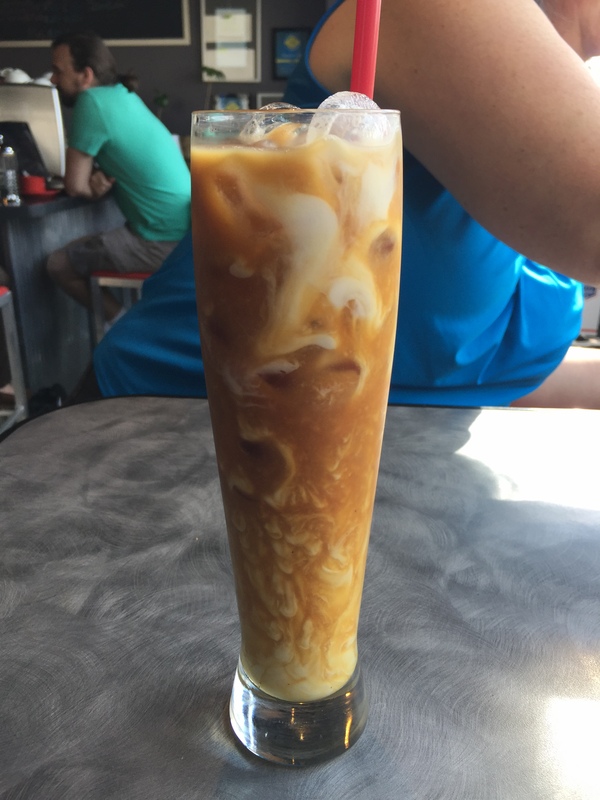 The barista had recommended putting chilled coconut milk into the coffee to cut the acid, rather than regular lactose 2% milk; holy cow, that was ridiculously good! Who would have thought to do that? I’ve never seen that offered at any other coffee shop, and being slightly intolerant to lactose, it made my stomach very happy. If you consider yourself a coffee connoisseur, I can guarantee you will fall in love with this place. You won’t find any food served here, as they want to preserve the delicious smell of coffee in the air without the distraction of food. They are not open on Saturdays or on Jewish holidays. You can sign up to be on their mailing list for fresh roasted coffee beans. If you really enjoy their cold brew, you can buy it by the bottle and exchange it for a new bottle whenever you’re ready for a new one! Efficient AND environmentally friendly! 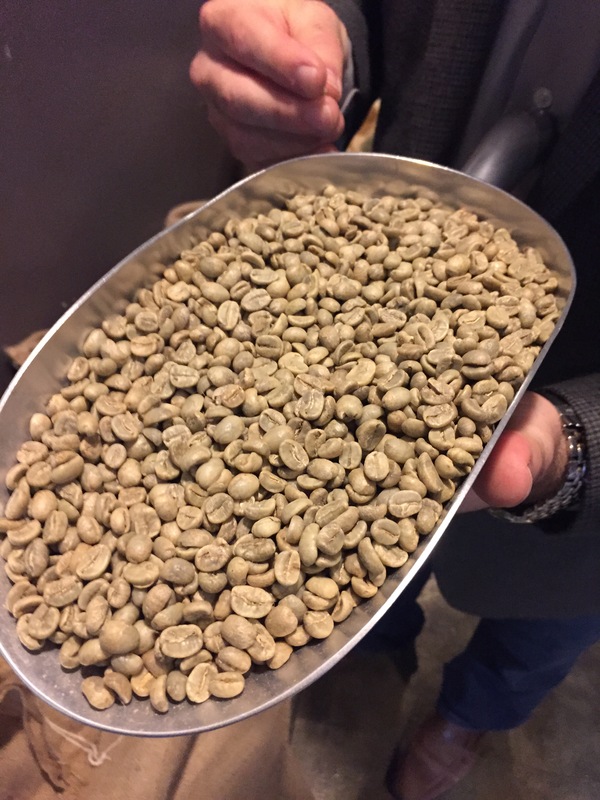 You can also do coffee tasting there, similar to wine tasting….I’m not sure how much it costs, or if you have to reserve a spot ahead of time, but I think it’s a very unique feature that should be explored! From Ferndale, we headed down to the beautiful Belle Isle. We had an amazing afternoon out there, with a strong breeze contrasting the heat from the bright sun. It was perfect. 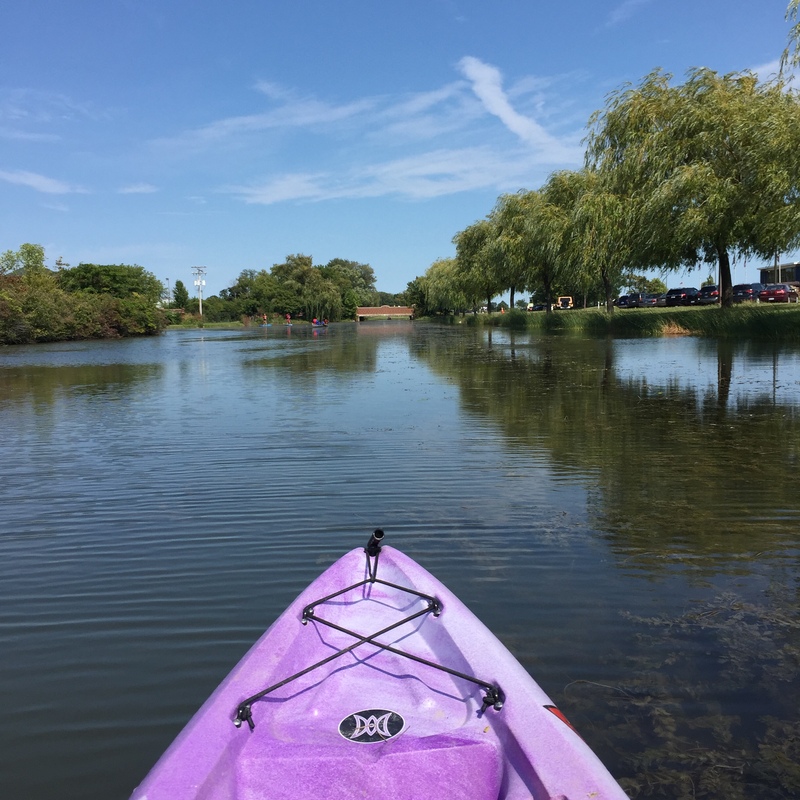 This is not relevant in my food review, but we went down there to kayak….and kayaking sure left us hungry! We were so hungry after an hour of kayaking that we decided to eat an hour before our reserved time. I had heard a ton of amazing reviews for Bistro 82 in Royal Oak and finally decided to make a reservation for 6PM this evening. 6PM couldn’t come sooner, so we headed in at 5. I want to say I liked it, but I’m conflicted. Is it a “hit it & quit it” type restaurant? Maybe….although, I am curious about the other items on the menu….. I was thinking all night how I wanted to review it…I think I’m going to rate my experience dish by dish. Bone Marrow: My husband and I both agreed we would give this a 6 or 7/10. 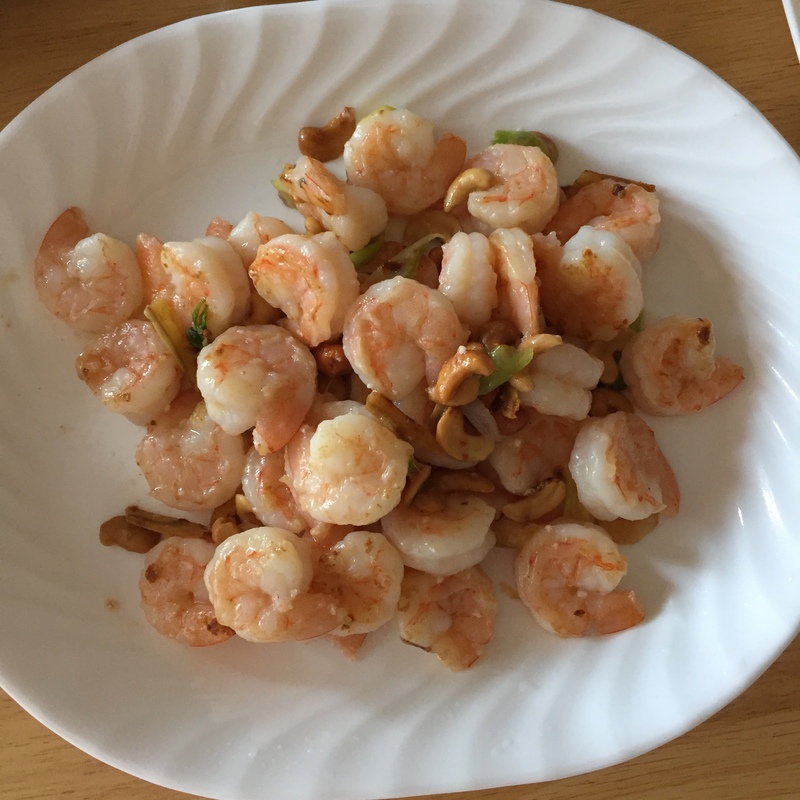 It needed a smidge more salt, and something….pickled….something to cut the fattiness and texture. The acid of the lemon wasn’t enough. Probably won’t be ordering this again. 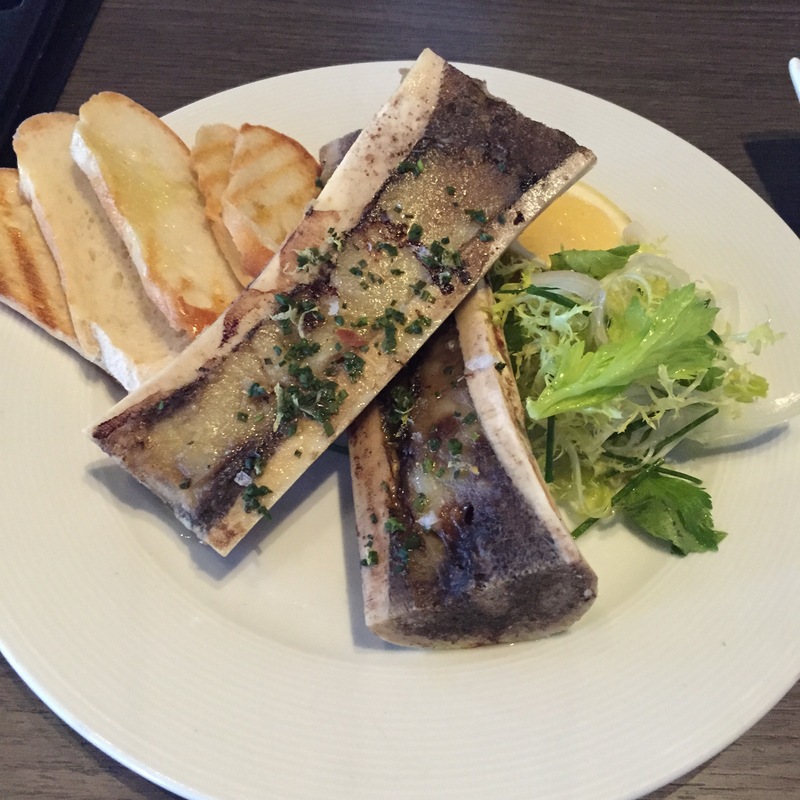 If you want good bone marrow, head to Michael Symon’s Roast at the Westin Book Cadillac. 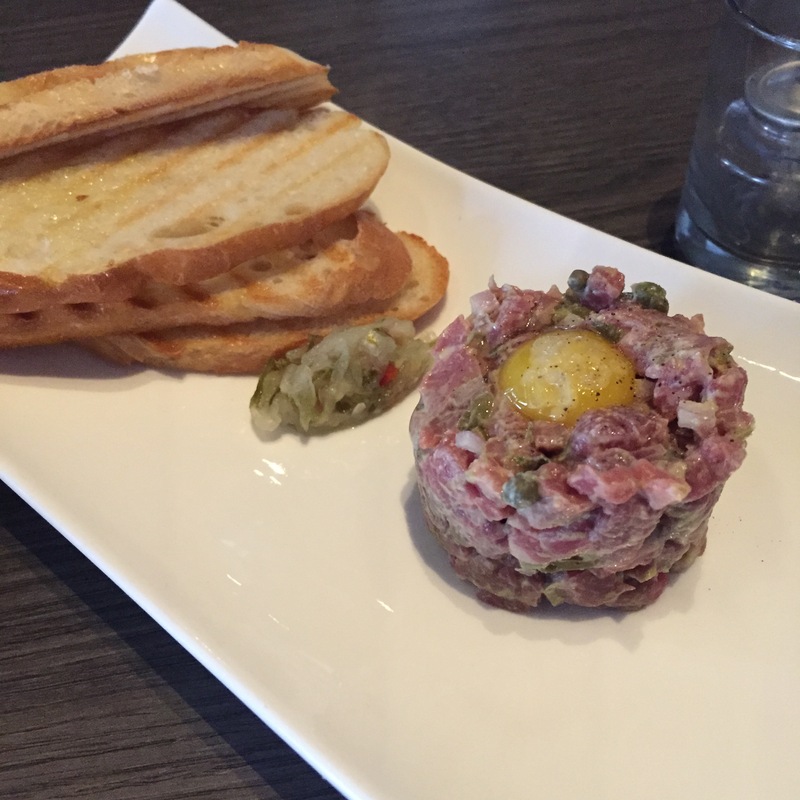 Beef Tartare: YUM! This was delicious. We give this a 9/10. The portion was rather small, but the capers and the hint of mustard, worked SOOO well together. Their bread is made in house, and had the perfect amount of crunchiness. The only reason I wouldn’t give this a 10 is because I have had better…BUT this is definitely a top contender. Our waiter convinced us to get a pasta course and split it….so pictured above is my “half”. 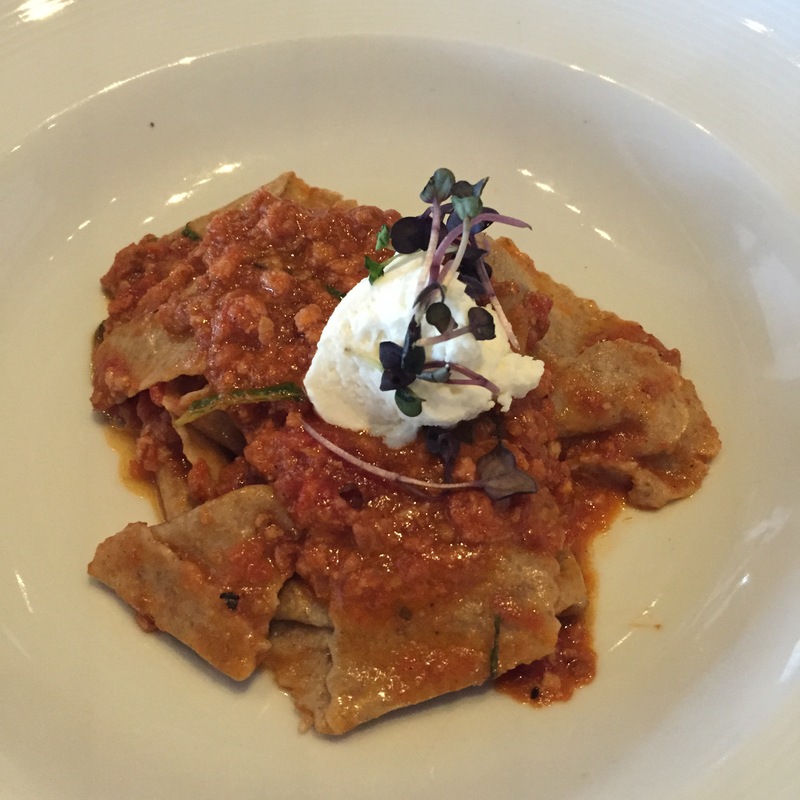 Rye Pappardelle with beef and lamb ragu: This was surprisingly light! I rather enjoyed the simplicity of the ragu, but the rye was a little too grainy for me. On top was a dollop of ricotta, and a sprinkle of mint. The mint should have been replaced with basil. To keep with the rustic Italian flavor of the ragu, the mint was too much of a strange contrast. 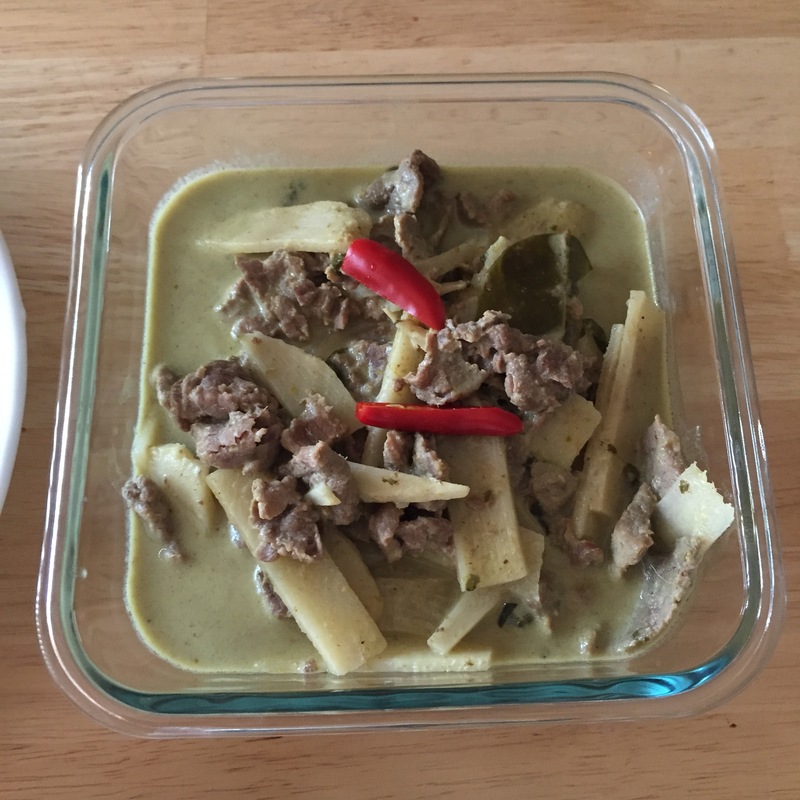 I understand the pairing of lamb and mint, and how they go hand in hand….but the flavor threw us both off. Other than that, this dish was about an 7/10. Scallops: This was my entree. After hours and hours of thinking about it, I still don’t know how I feel about it. The scallops were very nicely seared, and the flavor of the scallops were on point. Everything else was just kind of…blah. The mush of stuff laying on top of each scallop was strangely sweet, but not in a good way. There were thin slices of what could have been pancetta or bacon, but even that couldn’t save the dish. I really don’t have much to say about this dish. Disappointingly underwhelming. 5/10. 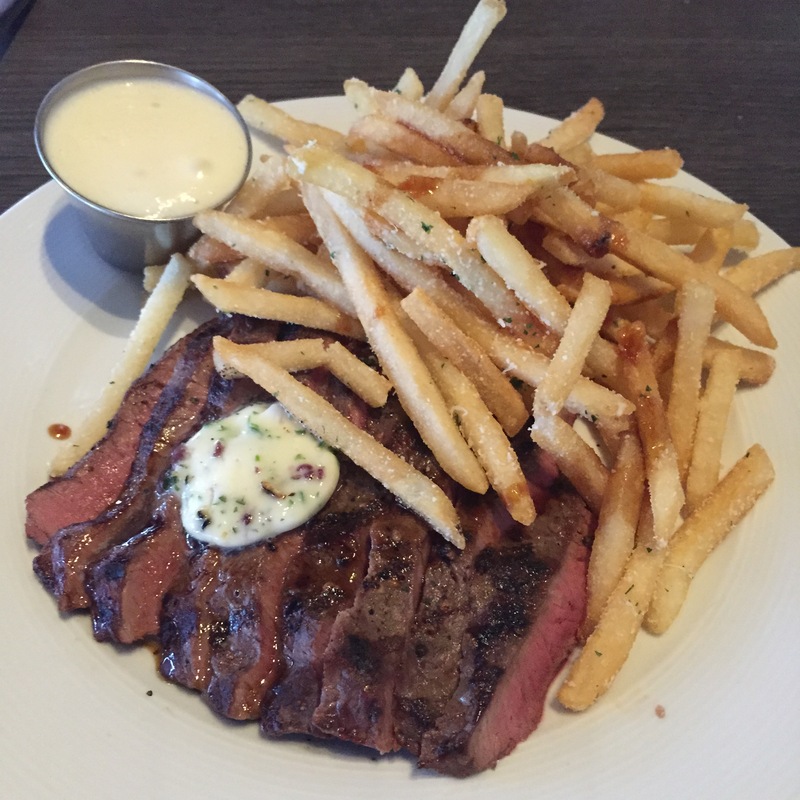 Steak Frites: I applaud this dish. The fries were PERFECT. This was my husband’s entree, but I stole a fry every chance I got! Definitely in my top 3 of best fries I’ve ever had….they tasted similar to the duck fat fried fries from Toast in Birmingham….perfectly salted, crispy, chewy, and moist. The steak had this amazing charred taste, and delicious marinade on top…a super light gravy or au jus, and what appears to be herb butter (I could be wrong because I hadn’t read the description). I would give this an 8/10. The steak itself was probably a 7, but the fries definitely bumped up my rating! 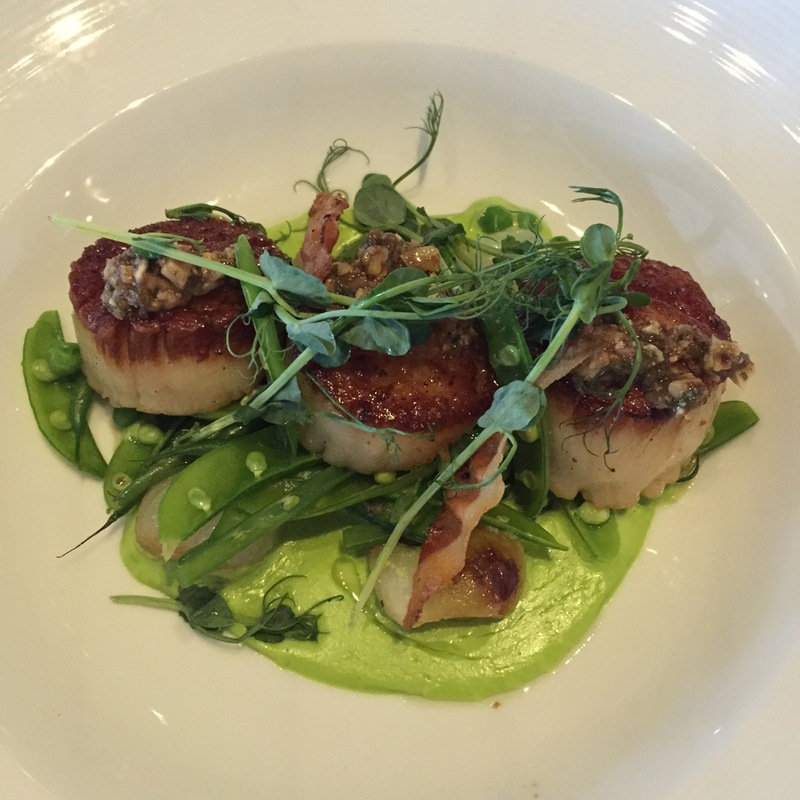 Overall, I had a great experience at Bistro 82. I think my real conflict with whether I truly liked it is predicated on the fact that there are SOOOO many restaurants that serve close to the exact same menu. Everything on this menu was too familiar….maybe it’s a food trend? And yes, maybe it’s because I like to order the same things over and over again, but I do that because I at least know what to compare them to. I have a bar set for my favorites in each category, but I am always on the hunt for a new favorite spot for a particular dish. All the foods I had there tonight, I’ve had before. Did any of them stack up to my favorites? Not so much, but it was worth a try!